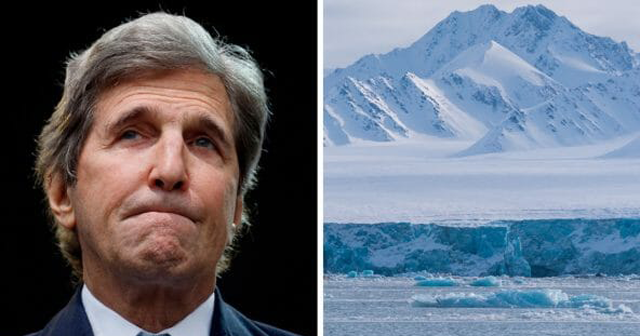 Of all the devotees to the left’s fervent cult-like religious belief in man-made climate change, perhaps none have been more annoying, and provably wrong, than former Secretary of State John Kerry — save perhaps for the climate change cult leader himself, former Vice President Al Gore. As a top official in former President Barack Obama’s administration, Kerry used his position and clout to further the narrative that human activity was causing devastating damage to the earth’s climate, so much so that drastic action needed to be taken, such as raising taxes and sacrificing freedom and liberty to the government, because of course, that will help save the environment. You may even recall that Kerry’s devotion to the “science” of climate change led him to declare that it was the changing environment that was somehow inextricably linked to the civil war in Syria, the rise of the radical Islamic State group and the subsequent flood of Muslim refugees into Europe. But let’s flashback a little bit further than that, to when Kerry was still a Democratic senator from Massachusetts in 2009. At that time, he made an incredibly bold prediction — based on “science,” no less — that man-made climate change would cause the Arctic to be “ice free” by the summer of 2013. Calling out then-Republican Oklahoma Sen. James Inhofe during a speech on the Senate floor, then-Sen. Kerry chastised his colleague for supposedly being both “wrong on the facts” and wrong politically with regard to remarks he had made downplaying the supposedly catastrophic risks of climate change. “I wish he were really up to state-of-the-art with respect to the science on global climate change,” said Kerry of Inhofe. “You have sea ice, which is melting at a rate that the Arctic Ocean now increasingly is exposed. In five years, scientists predict we will have the first ice-free Arctic summer,” warned the senator ominously. “That exposes more ocean to sunlight. Ocean is dark. It consumes more of the heat from the sunlight, which then accelerates the rate of the melting and warming, rather than the ice sheet and the snow that used to reflect it back up into the atmosphere,” explained professor Kerry. Except, unfortunately for Kerry and climate-centric acolytes, his dire prediction of an ice-free Arctic summer by 2013 did not come to pass. Instead, as was noted in a hilariously tongue-in-cheek article from Forbes in Sept. 2013, the Arctic ice sheet that summer was actually about 60 percent larger than it had been during the summer months of 2012. That article proceeded to note how all of the climate alarmists who had previously predicted the Arctic would be ice-free by that point were simply acting as though they had never made such predictions. Indeed, many simply extended their estimations of impending doom out another five or ten or twenty years, as if they hadn’t just been proven incredibly wrong. So, too, do the climate alarmists still do the same today. A simple internet search on “Arctic ice-free summers” will turn up tons of breathless articles decrying the imminence of how the Arctic is still on track to be ice-free … by no later than 2040 or so. For example, a website called PhysicsWorld, which would presumably be strictly science-based, now predicts the Arctic will be ice-free during August and September in as few as two decades, and almost completely ice-free for even more months out of the year by 2060. However, those apocalyptic predictions are a bit hard to accept, given just how wrong the self-anointed ministers of climate change have been in the past.